The beautiful St. Isaac Cathedral (Isaakievskiy Cathedral) was built during the reign of the Tsar Alexander I. The project was designed by the French-born architect Auguste de Montferrand. It took almost 40 years to construct the cathedral, under Montferrand’s direction, from 1818 to 1858. It was dedicated to the patron saint of Peter the Great – Saint Isaac of Dalmatia. During the Soviet era, the building of the Cathedral was turned into the museum of atheism. A Foucault pendulum was set inside, to demonstrate to the people that the earth is turning. Despite its huge size and standalone position, the dome had luckily survived during the World War II, and the days of the Blockade of the Leningrad. At that time it was overpainted in gray, to avoid being seen by the enemy aircrafts. 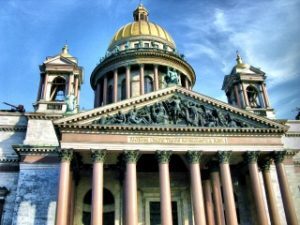 The cathedral has a neoclassical exterior, it is set by the traditional Russian-Byzantine formula of a Greek-cross plan with a large central dome and four subsidiary domes. The interior of the dome was initially decorated with paintings of the great Russian masters, that were later replaced with mosaics. This excursion is not available on Wednesdays (museum day-off).